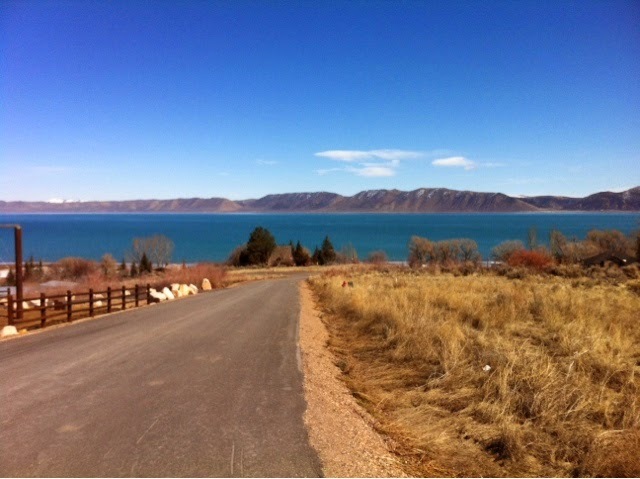 I got a chance to go to a retreat in Bear Lake this past week and it sure was a treat! I was able to go last year as well and I look forward to going again in the future for sure. 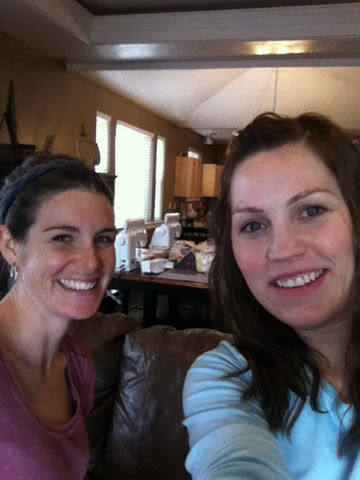 I don't know if everyone knows what a sewing retreat entails so I will give you the run down. On our retreat we chose to go far enough away that we were able to forget we were wives, moms, grandmothers, sisters, friends - we were just quilters :) That happened to be in Bear Lake for us. For the drive up we shop hopped to all the awesome stores on the way. We hit our last one in Logan which was one of my favorites "My Girlfriend's Quilt Shoppe"! Here we are in the pic below with those amazing twins Kim and Kris. Then after lunch and a lot of shopping we made it up to take in this awesome view. So So So nice. 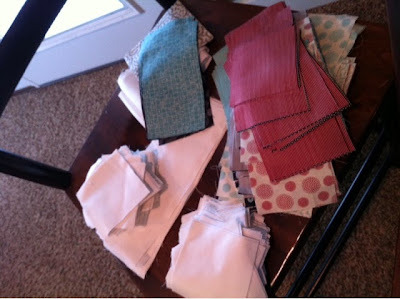 The first day was pretty much gone but we were determined to get sewing so that evening we started project #1. 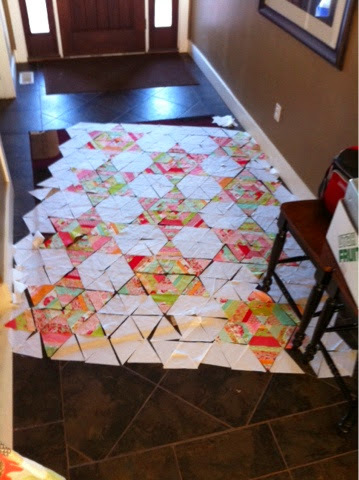 Before I went on the retreat I was able to do a little pre-cutting to make the quilts go a little bit faster. Here are my stacks ready to go. That way I only had to sewing and press. So I won't go into too much detail because the next couple of days were just a blur of sewing sewing sewing sewing cutting sewing stitching and sewing. I will share a few more pics though, below is one of my partners in crime miss Katie. We had to go a little earlier than the rest to meet my In-laws for the cabin but it was worth it because we got to get a head start sewing. Quilt #1 Finish - I picked a pattern from one of Camille Roskelly's books. I prefer to do fast projects at retreats because they are a safe bet that you have enough material and aren't going to change too much. 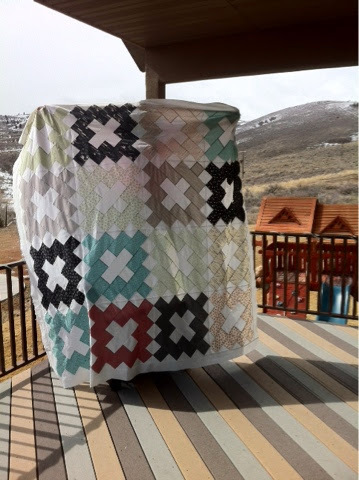 There are a lot of quilts especially now that I rely on my stash quite a bit and because I can't even begin to fit my stash and two other women and all our clothes in my car I have to make SURE that I have a non-stash quilt. So here is Camille's Vintage pattern altered a little bit by adding an extra row from here book Simply Retro. 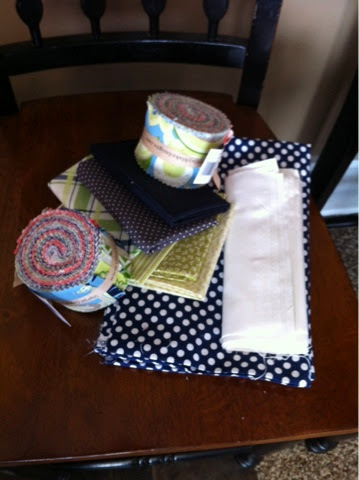 Next project was a excuse to use a couple of jelly rolls. Quilt #2 finish. 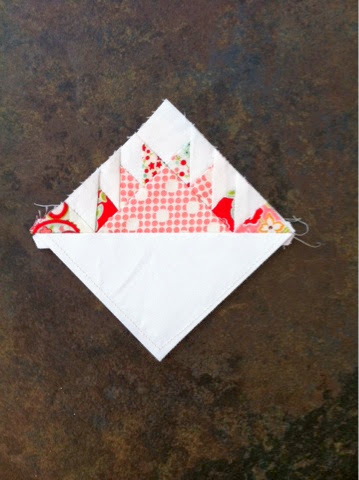 This is another pattern from Camille Roskelly in her first book Simplify. 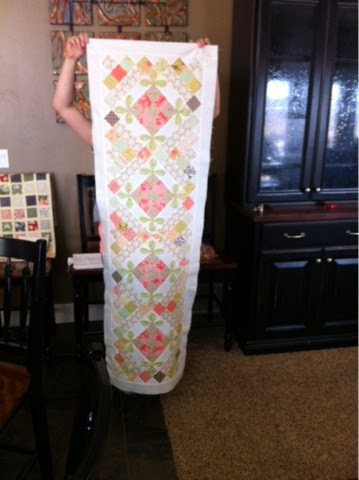 This was a super fast quilt that was a great break from the first one with it's chain piecing and squaring up. This was just fast as ever with a little appliqué. 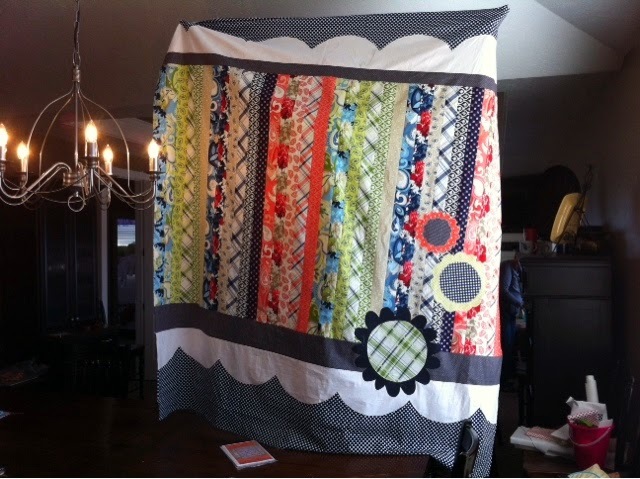 I loved it :) I can't wait to quilt this little bug up. 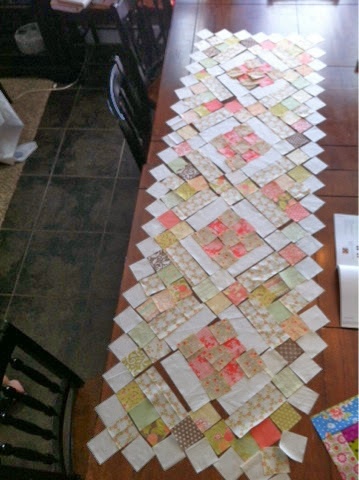 The third quilt I decided to tackle was a table runner using my mini pre-cut 2 1/2" squares. I used two of these little pre-cut stacks and a couple fat quarters. I was so fun to lay out and then get sewing. I did ask myself why I decided to do essentially two quilts on point when making this next on but it wasn't too much trouble. I have to mention that amongst all that sewing we did take breaks to eat and the food was fabulous! It was yummy and a great treat to visit with all the women. 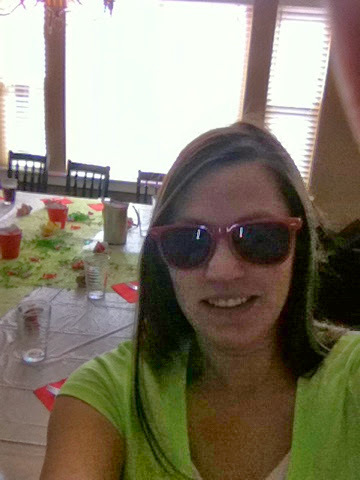 Oh yeah there were some favors ;) I've got my own set of sew red glasses now. Quilt #3 finish - This quilt was fun. 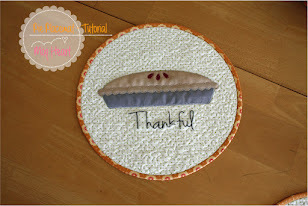 I used a pattern from the Knockout Neutrals book. This pattern was stunning. I loved the design. I pieced my runner as opposed to appliquéing the blocks down. I think that it will give me a better result and it wasn't any big deal at all to add those extra squares to the outside. The green leafs are appliquéd however. I took the leaf appliqué with me into the theater to watch a movie and turn which went by pretty painlessly. I think I complained once, lol. The only quilt that didn't happen was this one. I made this with a 60 degree ruler with strips varying in width. I didn't get a chance to finish this one because my brain was melting and I couldn't do it anymore. I did stack them and label the rows so eventually I will get this little beaut sewn but for now I am back to being a mom and a wife and other things so it'll have to wait. Well I definitely feel spoiled to get to spend five whole days with some of the best ladies! I had a blast and I wanted to share a bit of that. If you ever get a chance to try out a retreat I would jump right in and have a blast. It would be a wonderful treat. That does sound like a lot of fun! It looks like you got tons done and it was beautiful up there so win win. I am a little (okay a lot) jealous! Bear Lake was my second home growing up and I definitely miss it, but you also got to meet Kim & Kris! They are so awesome! 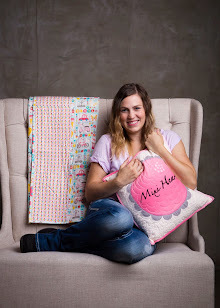 Again, love the Camille Roskelly quilt. It is still winter here and the bright colors are definitely speaking to me! 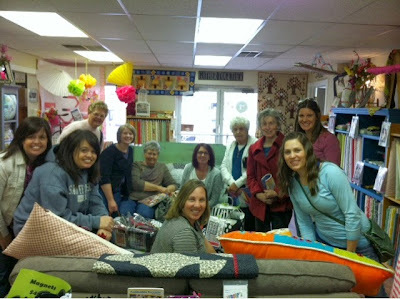 Your quilts were amazing, I loved all your fabrics so much! It was fun seeing how much we could really accomplish in one short week! Plus I know of a fifth quilt you started but haven't shared! That one was fun to get started on!